A stay at Taba Luxury Suites places you in the heart of Istanbul, convenient to Istanbul Cevahir Shopping and Entertainment Centre and Dolmabahce Palace. 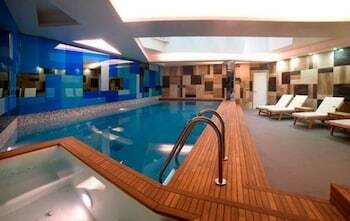 This spa hotel is within close proximity of Trump Towers Istanbul and Yildiz Technical University. Make yourself at home in one of the 53 air-conditioned rooms featuring LCD televisions. Your room comes with a Select Comfort bed. Complimentary wireless Internet access keeps you connected, and satellite programming is available for your entertainment. Private bathrooms with showers feature rainfall showerheads and complimentary toiletries. Relax at the full-service spa, where you can enjoy massages, body treatments, and facials. If you're looking for recreational opportunities, you'll find an indoor pool and a sauna. This Art Deco hotel also features complimentary wireless Internet access, concierge services, and babysitting/childcare (surcharge). Guests can get to nearby shops on the shuttle (surcharge). Take advantage of the hotel's 24-hour room service. Quench your thirst with your favorite drink at a bar/lounge. Buffet breakfasts are available daily from 7:30 AM to 10:30 AM for a fee. Featured amenities include a 24-hour business center, express check-in, and express check-out. 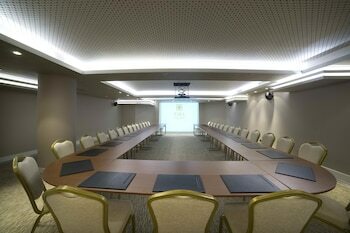 Planning an event in Istanbul? This hotel has 1076 square feet (100 square meters) of space consisting of a conference center and meeting rooms. Free valet parking is available onsite. 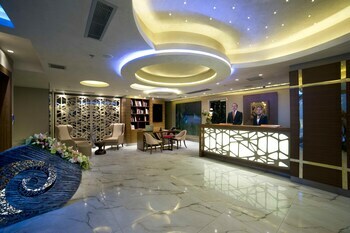 Taba Luxury Suites & Hotel is the perfect Istanbul lodging choice for your trip to Turkey. With numerous amenities for guests such as 24 hour front desk, jacuzzi or spa, concierge, you will wake up at Taba Luxury Suites & Hotel feeling refreshed every day for your time in Istanbul. Don’t let this amazing reservation opportunity pass you by, book your stay at Taba Luxury Suites & Hotel today to make the most of your time in Istanbul, Turkey.